B. B. Thatcher (Benjamin Bussey), 1809-1840 Memoir of Phillis Wheatley, a Native African and a Slave. 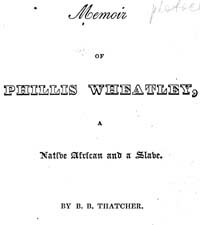 Memoir of Phillis Wheatley, a Native African and a Slave. Boston: G. W. Light; New York, Moore and Payne, 1834. African American poets -- Biography. African American women poets -- Biography. Slaves -- Massachusetts -- Boston -- Biography. John Hay Library, Brown University, provided the text for the electronic publication of this title.